Next time you’re thinking about hiring someone for snow removal, lawn care, deck building, remodeling, or any other type of home project, consider contacting Building Bridges Professional Services. Not only will you receive professional services at reduced or competitive rates, but you’ll also give at-risk young adults an opportunity to earn money and gain valuable work, leadership, and cultural experiences. Building Bridges began in 2007 as a way to address youth violence and unemployment in the inner city by paying young adults to cut the grass at vacant and foreclosed homes. Now six years later, this program operated by Bethany Christian Services and Urban Family Ministries has grown to offer year-round, professional services to the community. Building Bridges provides work opportunities to low-income young adults, ages 16-24, with barriers to employment. The youth employed by Building Bridges may have previous criminal charges, be involved in the foster care system, come from a refugee family, or have difficulties finding a job for other reasons. The Youth Services Department Manager at Bethany Christian Services, Justin Beene, also acts as the Program Director at Building Bridges. He says the program is “a hand up, not a hand out” and they encourage positive work habits. If an employee is late three times, for example, they are let go. The professional services Building Bridges offers include everything from snow removal to grass cutting, trimming, fall and spring cleanup, gutter cleaning, power washing, and more. They have recently added two licensed builders and a landscape architect, so now they can also provide remodeling, deck building, and landscaping services. Basically, if you have something inside or outside your home or business that needs to get done, ask them to give you a free estimate on the project. They prefer seasonal work, but can do one-time projects as well. Each project is managed by a site supervisor who will make sure the work gets done correctly. The company is also fully insured. Located within the Home Repair Services building on South Division, they primarily serve the southeast side of town, but they can perform work anywhere in Grand Rapids. In addition to earning money, youth also learn important personal and professional life experience. Once a week, the employees are invited to join in “enrichment activities” where they learn money management skills, interviewing and resume building techniques, anger management, and more. They visit colleges and local businesses and receive educational support as well. 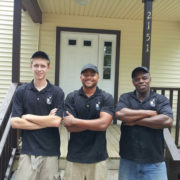 On average, Building Bridges employs around eight youths during the summer months and four who work throughout the year. They each start out at minimum wage and get paid more with experience. “We believe work is an avenue to building character and transferrable skills,” Beene says. Building Bridges initially received grants from various organizations to start the program, and now about 50 percent of their funding comes from the fees they receive for services. They maintain many large contracts, including one for the Kent County Senior Millage that provides free lawn care to low-income seniors. The employees take pride in the work they do and don’t want people to hire them out of sympathy. “Hire us because we do an excellent job at a decent price,” says Beene. – Visit Building Bridges online to find out more. – Request an estimate to have work done around your house or business by filling out this form or by calling 616.574.7940. – To volunteer your time as a speaker or a mentor, or to donate hand tools and landscaping equipment, email Building Bridges. – Like them on Facebook. Source: Justin Beene, Youth Services Department Manager at Bethany Christian Services and also the Program Director at Building Bridges.